BLOOMINGTON, Ind. -- Pallabi Chakravorty, a visual anthropologist and founder and artistic director of the contemporary Indian dance ensemble Courtyard Dancers, will give a performance of classical Kathak dance on Saturday (Oct. 23) at Indiana University Bloomington. Chakravorty's performance will begin at 8:30 p.m. in Recital Hall in the Jacobs School of Music's Merrill Hall. The event is being presented by the IU India Studies Program and is free and open to the public. 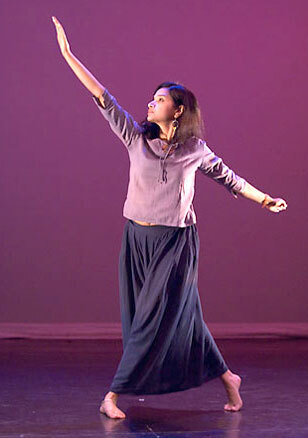 Based in Philadelphia, she is a faculty member in the Department of Music and Dance at Swarthmore College, where she teaches both Kathak technique and theory courses in dance anthropology. Trained by legendary gurus in Calcutta from an early age -- such as Kathak doyenne Bandana Sen -- Chakravorty's dance works range from traditional repertoire to contemporary choreographies and explore the interdependence between art, life and labor. Her inter-disciplinary scholarly work has been published in many journals, including South Asia, Dance Research Journal, Visual Anthropology and Moving Worlds. She is the author of the book, Bells of Change: Kathak Dance, Women and Modernity in India (Seagull Books, 2008), and is the editor and co-editor of three other books, Performing Ecstasy, Dance Matters and Dance in South Asia. Her current research focuses on Indian dance, media, and Bollywoodization of culture. A recipient of many grants and awards for both her scholarly and artistic works, Chakravorty recently premiered her new choreographic work, "Celluloid E-motions," in Philadelphia. More information about IU's India Studies Program is available at http://www.indiana.edu/~isp/.